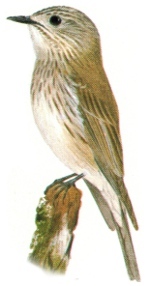 The Spotted Flycatcher has an obvious brown speckling on the crown and breast. The birds tail is frequently held downwards as if trying to balance, and the long wing tips are usually visible as they protrude on either side. The eyes are large and dark and the Spotted Flycatcher has a constantly alert appearance. A fairly common summer breeding bird to the UK. Widespread distribution in Europe, however numbers are declining and the bird is considered vulnerable. Winters in Africa. Open broad-leaf woodland, parks and gardens and especially churchyards. The Spotted Flycatcher may be largely brown and dull, but it is none the less a beautiful charismatic little bird, often seen using gravestones or telegraph wires as a base for hunting passing insects. Occasionally you can hear the birds bill snap shut as it grabs an insect in mid-air, large catches such as wasps and bees are dispatched by being beat against a branch upon the birds return to it's perch. Usually seen out on a perch with a good view, the Spotted Flycatcher will sit watching for passing insects, flying out to catch them as they pass and then returning to the same perch to wait for another.